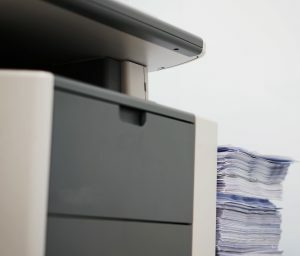 How do you get the most out of your office printer? How do you get the most out of your office printer? We’ve all seen the movies where printers are cranky, temperamental machines. Still, there are some useful hints you might not think existed that you can use to bring your office printer to its maximum efficiency. In this week’s blog, we will go over those hints and show you how best to get your printer in a good mood. Just follow these simple tips and tricks! Do more with Features and Functions: Maximize how the paper trays in your printer work. Regularly check for jams and ensure enough paper is always loaded into it. Passwords and key cards can be useful ways to protect documents that need to stay secure as well. Select any possible finishing options that your printer can provide. This method will spare your team members countless hours of tedium and frustration, not to mention save time for them to address other tasks. Enable Wi-Fi printing to have printing done on the go. Other types of paper or page media are likely usable as well, and not just plain old printer paper. Think About Your Printer’s Location: Where in your office is the printer located? Find someplace else where it could be more accessible to your employees. While a central, easily-reached location might be simple, also take into consideration volume demands. After all, one employee could print several large documents every week, while another could be scanning receipt after receipt every day. Try to avoid placing your printer in high-traffic areas, or somewhere in the back of the office that is hard to find. Following these steps will improve productivity and prevent the dreaded bottlenecks from happening. This entry was posted on Wednesday, March 29th, 2017	at 8:23 am	and is filed under Blog, Equipment handling, Printing tips	. You can follow any responses to this entry through the RSS 2.0	feed. Both comments and pings are currently closed.